Batting: Alex Hales 147 off 92 balls, Johnny Bairstow 139 off 92 balls, Jason Roy 82 off 61 balls, Eoin Morgan 67 off 30 balls. Bowling: Jhye Richardson 3/92 in 10 overs, Ashton Agar 1/70 in 10 overs. Batting: Travis Head 50 off 39 balls, Marcus Stoinis 44 off 37 balls, Ashton Agar 25 off 24 balls. Bowling: Adil Rashid 4/47 in 10 overs, Moeen Ali 3/28 in 5 overs, David Willey 2/56 n 7 overs. Having lost the previous 2 ODIs of this 5 match series, this match was the decisive match for Australia to save the series. Australian captain Tim Paine chose to bowl as it was a fantastic wicket to bowl first as Morgan would also have chose to bowl first. Both openers started off aggressively and brought up a 50-run stand in 8 overs. Spin was brought into the attack and some chances were created like Bairstow surviving an lbw appeal and his dropped catch by Stoinis. These chances were made full use off by Bairstow who reached his half-century inside 39 balls. And, one over later Roy also joined him by scoring his fifty off 41 balls. At this point a 100 run stand was reached between the two batsmen and Australian bowlers had been wicket-less so far. Both batsmen continued with the same aggression as England passed the 150 mark in 19 overs. At this point, Roy was on 80 runs and was eyeing yet another century. But, this time he was denied this milestone by Short who got the wicket of Roy with a direct hit at the stumps. Alex Hales joined Bairstow. Both shared yet another 50-run stand with Bairstow reaching his well-deserved century off 69 balls. Few overs later Hales also reached his fifty as the stand between the two passed 100 runs. Hales went berserk after his fifty as more boundaries began to flow from his bat. Meanwhile, Bairstow was eyeing his 150 but fell 16 runs short of it as Agar got his 1st wicket of the innings. Buttler was promoted up the order as he joined Hales. But, his stay only lasted 2 overs as Jhye Richardson claimed his wicket. Morgan joined Hales. And, in the same over Hales reached his century off 62 balls. Hales continued to score as England reached 400 runs in the 43rd over. 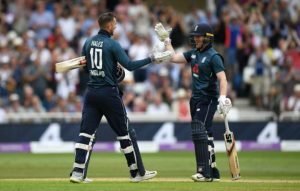 And, after a slow start Morgan too joined the party as he reached his fifty and also became the highest run-scorer for England in ODI cricket. The world record for the highest ODI score(444) was broken by England in the 46th over as England continued to march towards 500. 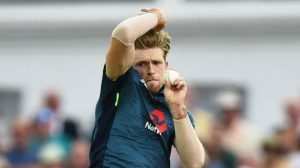 But, an excellent display of death bowling was shown by the Australians as Richardson claimed the wickets of Morgan and Hales in the same over i.e. 48th. Root and Ali were on the crease. But, the pair couldn’t hit a single boundary in the last overs as Moeen Ali lost his wicket and England finished on 481/6 in 50 overs. Social Media went ablaze with their reactions of this World record total. 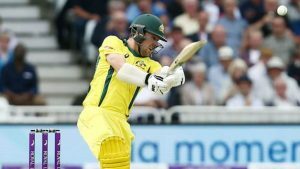 Australian openers Head and Short walked out to bat and Mark Wood and David Willey were brought into the attack by Morgan. Both openers made a rapid start to the innings but Short fell in the 4th over to Willey and England had their first breakthrough. The centurion from the 2nd ODI, Shaun Marsh joined Head. Both batsmen defied the English bowlers for quite some time and Head brought his fifty. Moeen Ali was induced into the attack. And, this move worked a Moeen struck in his 2nd over to claim the wicket of Head. Australia are having a good go but we’ve taken crucial wickets. Stoinis joined Marsh. But, Australia’s worries with spin were not over yet as Moeen Ali struck in his 2nd over to get rid of Marsh. Finch joined Stoinis. At this point, Australia were 2 wickets down and still needed 382 runs to win this match. Finch got some runs but couldn’t stay for long as Adil Rashid pinned him lbw and with that Australia lost their 4th wicket. Australia Vs England match had now become one-sided. Maxwell joined Stoinis and after sharing 20 runs with Maxwell, Stoinis got run-out, courtesy of an excellent throw from Bairstow. The Australian captain, Tim Paine joined Maxwell. But, once again he failed to prove himself as he departed of Adil Rashid’s exquisite bowling. Maxwell got out in the very next over to David Willey’s bowling. Agar and Richardson were now on the crease and 288 runs from 20 overs. How about this for a leap from @Liam628! Both batsmen resisted for a while before Rashid was brought back into the attack and claimed the wicket of Agar. Ali was brought back and he struck straightaway as Richardson became his 3rd scalp of the match. Rashid claimed the last wicket in the next over and England won the match by 242 runs and also won the ODI series by 3 – 0. Join Allsportspk on 21st June for the 4th ODI of Australia Vs England. Previous articleBreaking World Cup 2018 – Egypt Vs Russia: Who Won…?